Stay motivated and stay on track to a more active and healthier lifestyle. 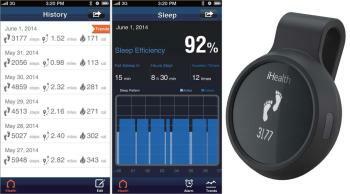 The iHealth Wireless Activity and Sleep Tracker is a device that tracks your daily activity and sleep. The iHealth Activity and Sleep Tracker tracks every step you take, distance traveled, calories burned, and sleep efficiency. It uses Bluetooth 4.0 with low energy technology and is sweat, rain and splash proof. Its silent alarm feature wakes you up gently without disturbing the person next to you, and the smart alarm feature helps you remember to be more active. A playful Activity Level feature motivates you to be more active for different levels of steps achieved. Each Tracker comes with two color options for wristbands and waist clips. This Tracker, along with the free iHealth MyVitals app, can keep you motivated and help you stay on track to a more active and healthier lifestyle. The Tracker can be worn one of two ways: on your wrist, or on your waist with the clip provided. When wearing on your waist, always use the clip provided, as the clip will trigger the Tracker to switch from “wrist tracking” to “waist tracking,” for maximum tracking accuracy. The free integrated MyVitals mobile app brings all iHealth products to life. Once you’ve downloaded it from the App Store, you can customize it for the products you use. iHealth makes it easy to set goals, track your progress and get inspired to manage your personal health in a more hands-on way, wherever you go. The iHealth app comes with a free online cloud service, where all of your data is backed up and stored securely. Log in to the app from any device and access everything, regardless of where you first recorded it. Weight. Blood pressure. Diet. Physical activities. They’re all aspects of your personal health and they’re all interconnected. So iHealth decided its mobile app should follow suit. Managing your health just got a lot more interesting. No matter which products you’re using, you can share results instantly to friends, family, even your doctor. The app also lets you track multiple users across different devices. 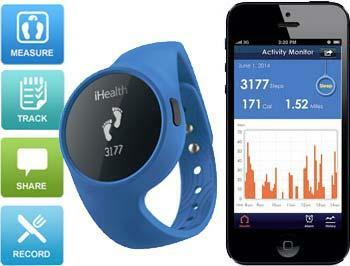 iHealth designs innovative, mobile personal healthcare products for everyone. iHealth’s line of wireless scales and blood pressure monitors has been revolutionary in the industry and continue to push the boundaries of what’s possible. Self-monitoring is not a new concept in healthcare. There are great products on the market that help people measure weight, blood pressure and other vital stats. The challenge with many of these products is that user data lives in the device only, and can’t be easily visualized, tracked or shared. iHealth’s integration with mobile technology has captured the imagination of its users, who can now measure, track and share their data, and play a more active role in managing their health.